My Cricket player rankings are out! And you won’t be able to easily guess who is the Most Valuable Player!! A Total of 366 players took the field in 2010 as against 368 in 2009 (this number is getting smaller every year for the last few years). 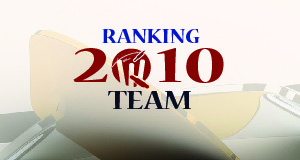 I have put out different ODI Ranking lists for teams and players. Do check each one out! India finished at the top in the ODI rankings this year. India had a phenomenal year and they won matches without their main batsmen at times. They rose to No. 1 in ranking. They won 12 out of 16 matches they played. South Africa came at No. 2 followed by West Indies, England and Australia. Sachin Tendulkar played just 2 matches in 2010. However, by scoring the all-time high of 200* he made it to the top of the heap as the most valuable player of any team. He had a strike rate of 134! He beat the likes of AB de Villiers, Kallis, Amla, Flintoff, Sehwag, Pollock, Afridi, Maharoof, Yuvraj, and Gayle just like that! Otherwise, AB de Villiers scored 964 runs in 16 matches at an average of 80.33 and a strike rate of 102 to come second in the list. Hold on. He also took 22 catches and 1 stumping to be a part of 23 dismissals. Amla was the most explosive batsman on scene in 2010. He scored 1058 runs averaging 75.57 in just 15 matches and a strike rate of 104.23. At the top of the heap is Ngoche of Kenya, who captured 13 wickets in the just 9 matches he played at 18.23 apiece. And he spent a miserly 3.08 runs per over to land right on top. He emerged out of nowhere in 2009 to be at the top in 2010.